In this blog-post I am continuing with the Kindergarten Paranoia series, focusing here specifically on paranoia towards social relationships and friendships with other children. However I am also going to share a general perspective on how the current educational systems specifically those dealing with the first few years of a child’s life, are failing not only our children but the future of humanity as a whole. When I look back, this point was not as prominent in kindergarten as it was later in my school years however obviously many of the points I experienced towards friendships and social relationships were the same. Distinctly there are two points that I see as relevant. One was that I was from a very early age conscious about ‘romantic’ relationships and I remember how I was trying to get boys to be my boyfriend. I even asked one of them who said no and after that I simply went on pretending that he was my boyfriend. I decided it was so and so it was lol. Except he didn’t know about it. Another point was within how we would use birthdays as a way to exclude each other in our group. So if someone got into a conflict or wanted to manipulate each other, they would use the phrase: “then you can’t come to my birthday party!” – This was virtually the worst thing that could happen to one of us and thus the absolute worst thing to say and it worked immediately because no one wanted to not be invited to a birthday party. What is interesting is that there was a rule about birthdays where everyone was always invited so no one was excluded in fact – but I know that it doesn’t work like this everywhere and thus children do in fact exclude children from coming to their birthday parties out of spite. So obviously one of us had gotten it from somewhere and then found it useful as a manipulation tactic. What is also interesting is that this form of direct evocation of fear in another child was piercingly deliberate and malignant and thus indicates that the infectious seed of paranoia is planted already early in childhood but even before that with the genetic seeds we carry with us from our parents – nature and nurture mixed into one big paranoid mess. Now obviously this form of paranoia did not enter before we were two/three/four years old and still at that age there was a limited mental activity in the form of actual thoughts and backchat. And before I was four I don’t remember much about social relationships. In fact all my memories from before I was four are about physical experiences, touching, seeing, feeling, hearing, smelling and tasting. Before I was four I also did not see or experience myself or other people as separate entities. It was not so that I explicitly experienced it all as ‘one’ – but there was simply no consideration within me of individuality. The best way to describe it is as if the world moved farther away when I turned four, people became more distant and therefore distinct in their individualities, where as before I experienced everything as being close – my entire world was the physical. Obviously when we got older the scheming and plotting increased and so did the emotional reactions. But it still surprises me when I look back, to realize that paranoia existed already then, spitefulness existed already then, ego existed already then – which is why it is no wonder that it is so difficult to change, because this is what we have known our entire lives. And at the same time there is a definite disjunction between the ‘three worlds’ if you will – the physical world was placed in the background. It was our backdrop, our stage, our props and scenography – nothing more. The world that governed was the world of the mind – the conscious, subconscious and unconscious development and influences that we at quantum speed absorbed and integrated into us, exactly as a machine being programmed with data for a specific functionality. The world we pretended to live in – the world the adults told us that we lived in is non-existent. It’s all an abstraction, a fantasy, a delusion, a mirage. And yet this is the ‘world’ we learned was real, the world we learned that we must survive in at all cost, the world that is ‘important’. And there, in the middle of this mess, a triage of total disconnection – stands the child. And the child is submerged into the constructed fictional world through words – literally through words and words emphasized through pictures. What is even more absurd is that this world is actually a symbolic representation of the mental world; it doesn’t even exist at any level except for at a theoretical level. So in our kindergarten we had to make ‘art’ for every holiday season. A specific memory was when we had to cut easter chickens out of cartboard and paint them to give to our parents. At the physical level what this meant was that we were training our motoric skills. And at that time mine weren’t particularly developed. I especially hated cutting with scissors because I was left-handed and the scissors was designed for right-handed which made it more difficult but also painful for me to cut. Okay so we’re sitting there cutting chickens and at a world-construct level, the point of the whole thing was to celebrate easter symbolized with the chicken as a token of spring. You could also say that there’s a ‘lesson’ in patience and developing skills and working with different materials and colors as part of a ‘creative developmental process’. Another ‘lesson’ that is highly praised in kindergarten philosophy or pedagogy is the importance of teaching children the norms, values and traditions of the culture they are born into. At a deeper level of the world-construct obviously Easter also references Christianity and the process of Jesus crucifixion, death and resurrection, though this was not a particularly prominent point in our kindergarten. 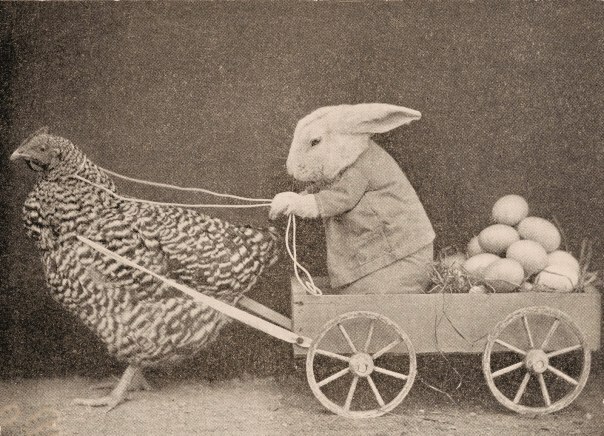 It also wasn’t explained to us what the connection was between Easter and eggs, chickens and bunnies. So in my childhood mind and even ever since, that is the association I have with Easter: bright yellow and pastel colors, cute bunnies, painted eggs, chickens and candy. That’s it. After the chickens were done we would then give them to our parents and our parents would say how beautiful they were and how proud they were of us and we would take the chickens’ home and display them for our Easter lunch with the family. (My mom still has my Easter chickens that she pulls out for an almost ceremonial Easter lunch every year – thirty years later!). So firstly a specific purpose with having children practice cutting with scissors is to develop their motoric skills. However no one ever told me that – there was virtually no focus on how I should move my hands to move the scissors or which movement I should express from within and as myself to effective cut. There was no consideration either that the scissors I was using were ergonomically wrong for my hands – which shows how this goal of strengthening motoric skills weren’t actually prioritized. I mean the adults could have sat with us cutting blank pieces of paper for example showing us how to move our hands – but they didn’t. In fact I remember how stressful the entire situation was because we were all sat together at the same time around our tables and then we had to cut chickens while the adults would walk around helping us and they weren’t particularly attentive towards that process as they were more focused on the ‘end result ‘and of having a ‘smooth day’. Within this, there is also a point to consider in how virtually no adults – let alone kindergarten teachers – actually understand how the physical body functions or operates or have a detailed understanding of how motoric skills are developed. So in a way it is like we more randomly or haphazardly coincidently happen to learn how to cut with a pair of scissors than actually learn based on a carefully considered process that is best for all. Also within this it is evident that having three adults and a room with twenty children is certainly not the best environment for children to learn anything, because all you get is a few seconds with a stressed out adult who has their focus split in twenty different directions. What this process is is socialization. Socialization means the process that children (and people in general) go through to become integrated parts of society who can ‘function’ in adherence to societies norms and standards. This process happens both deliberately through schools – as with the Easter example here – but it also happens at an implicit level which is what I explained before in how we as children are like machines sucking up data that we then use to program ourselves to a specific functionality. This is all pretty standard sociology and pedagogy knowledge and information. However – what is not mentioned is the purpose that this process serves, in terms of being the buldingblocks that hold society in check and that thereby holds the individual in check by creating this entire world-construct level we believe to be the real ‘reality’ that we live and breathe in – all the while it was nothing but a cultural construct – which is evident in how Easter isn’t a universal point of celebration and therefore isn’t something that is essential to the general life of humanity. It is linked to a particular culture, a particular world-view and a particular set of norms and values – that actually doesn’t have anything to do with real life or living. The only purpose cutting Easter chickens can have that would be of benefit is for children to learn how to use their hands to operate a scissors. But that is placed as a secondary priority to the ‘oh-so-important’ development of cultural norms, traditions and rules. And what does traditions teach us? That we BELONG to this group, this culture and this society. That we must repeat the past to ensure that society doesn’t collapse and that the world still has meaning and value. And so as children introduced to all these various forms of literal brainwashing and propaganda served to us by adults who have ‘graduated the program successfully’ themselves, we slowly but surely become submerged into society and it closes itself around us like a cocoon. What then also happens is that as we bring our Easter chickens to our parents and our parents say: “Did YOU do that? Wow – you are so good at making Easter Chickens, I love you so much my little angel, I’m so proud of you.” – we identify ourselves with the energy saturated through our parents words and we come to understand that our value is within the Easter chickens and the Easter chickens are therefore important for our identity and we are then a part of this enclosed world and because it feels good to be praised in that moment, we slowly but surely start submerging ourselves WILLINGLY into society. I for example persisted with learning how to cut Easter chickens until I had perfected it at the level I was able to, because I lived for that moment where my mother would say: “did YOU do that! ?” That was ME. That feeling right there was who I wanted to be. So all of this, all of what is going on in kindergarten and that is often even meticulously conjured up by ‘childhood development experts’ exists for one reason and one reason alone: to ensure the mind’s/world-constructs dominance over life on earth and the continuous exploitation of physical resources for purposes of maintaining the delusion we all call ‘reality’. And so as you can see, there is a lot more going on behind the scenes than we as adults are aware of. And still we believe that what we’re introducing children to as teachers and parents is the ‘real world’ when in fact it is nothing but a construct filled with meaningless values and norms and traditions that in no way consider actual reality. This world starts every day with children being born. And the way we as adults raise them – in total oblivion to the ACTUAL values we carry with us and imprint on them – is what re-creates this world, over and over and over. There is nothing of what currently exist in this world – this total mess we’re in on earth – that didn’t first come through teaching children a particular set of values, whether deliberately or implicitly. It is therefore of vital importance that we investigate and extrapolate what methods and ways of teaching that actually serve a functional purpose in the development of a world that is best for all. Because right now – we haven’t got a clue and the world is a daily re-minder of this. Why was it for example that I started separating myself from the physical reality when I turned four? How is spitefulness and paranoia so easily imprinted into children, when adults claim that this is something they would never do deliberately? Why hasn’t any experts answered these questions, if we have reached a stage in the evolution of consciousness where we have ‘control’ over our reality? And if we have control over our reality – which we must believe we have, since that’s what we’re teaching our children, why doesn’t the world reflect it and instead exists as the total opposite, as chaos, deceit, delusion and abuse? Join us in the development of a Living Income Guaranteed system where we will place an imperative focus on changing the educational systems of the world as well as develop real actual science through which we can get to the bottom of how the mind and the physical works in fact – so that we can sort this reality out and give our children a world that we would want to be born into.